Really? The Fed is Going to Raise Interest Rates in December?Really? The Fed is Going to Raise Interest Rates in December? Really? The Fed is Going to Raise Interest Rates in December? In behavioral economics parlance, this is known as confirmation bias whereby we look for confirming evidence while ignoring or not looking for that which might disconfirm what we believe. We all fall prey to that. My wife must do that all the time when it comes to me because if she didn’t I don’t know how she could put up with me for nearly 30 years! Fed to Raise Interest Rates in December? With that being said, however, there are some subtle indications that just maybe some Fed officials are seconding guessing themselves. But first to the charts. The St. Louis Federal Reserve Bank’s incredible FRED database of economic data covers virtually every economic indicator/statistic imaginable. One of my favorite Twitter accounts that I follow is SoberLook. I initially had my Twitter account set to alert me whenever a new tweet was sent by them but realized that I would never be able to focus or get some sleep because they tweet so prolifically and they are in the U.K. so the time change was problematic. Now I just check in on them on my own without being alerted. 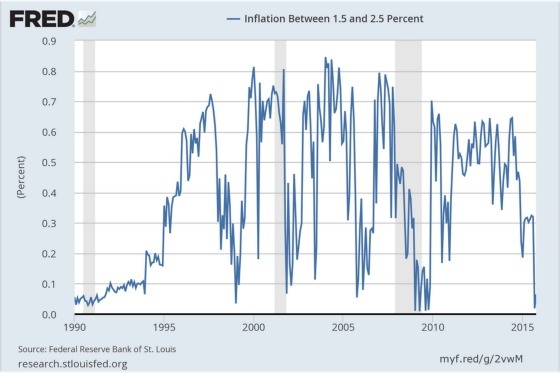 Last week they sent out a tweet highlighting some new inflation charts from FRED. These are quite fascinating because they calculate probabilities that inflation will be within certain ranges over the next 12 months. Hmm. 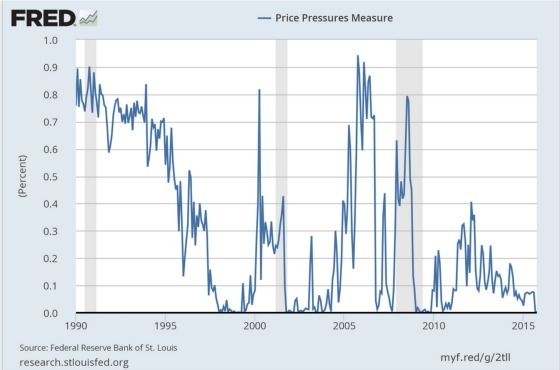 This sure doesn’t look like the kind of price pressure that would have the Fed itching to pull the trigger. Let’s dive a little more deeply into the modeling. 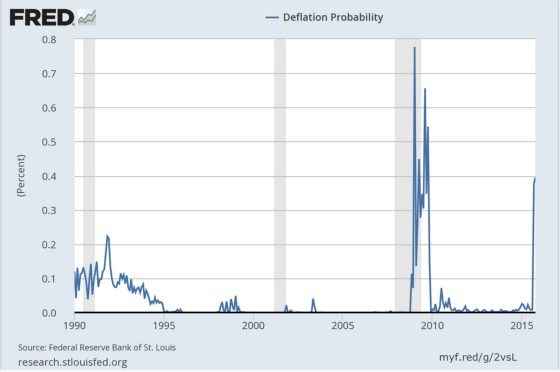 What is the probability that inflation will be between 1.5% and 2.5% in the next 12 months? With Janet Yellen having articulated that before raising rates not only must the labor market heal such that we have reached full employment, but inflation must be at 2% or higher, or to give them some cover, perhaps highly confident that it is trending there. Sorry Janet but this sure doesn’t look like you have a compelling case for this, especially since this probability is assigned to one of the Fed’s favorite inflation indicators, the Personal Consumption Expenditures Price Index (PCEPI). What are the chances that the PCEPI will be between 0% and 1.5% within 12 months? These models forecast that this range for the PCEPI has the highest probability of materializing at about 53.4%. 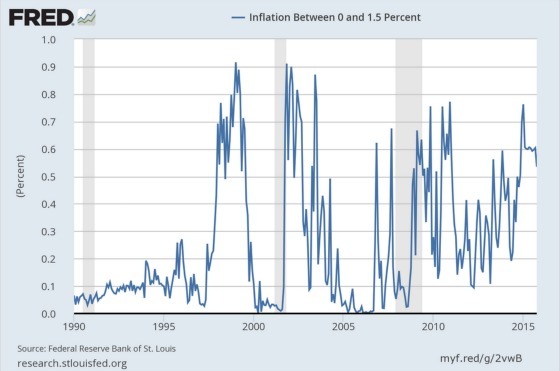 If there is essentially a 6.4% chance that this inflation measure falls between 1.5% and 2.5% and a combined probability of approximately 60% that it falls between 0% and 2.5% that leaves approximately 40% unaccounted for. So what is the missing 40%? DEFLATION. Yes, ladies and gentlemen, the one thing the Fed wants to desperately avoid is deflation and their models show a 40% chance of it happening within the next 12 months. Or, said differently, there is a 94% chance that inflation will be less than 1.5% over the next 12 months. Not the stuff of rate hikes from what this man can see. 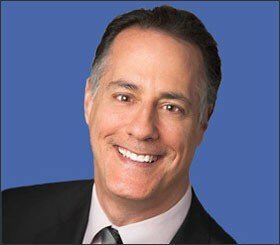 We haven’t had such a risk of deflation since the Great Recession and our economic conditions do not appear to be anywhere as weak as they were in 2008 and 2009. And lest you think that these indicators are an ivory tower and esoteric and have no applicability in the real world let’s look at one of the nation’s largest retailers, Nordstrom. They announced very poor earnings which are not a good sign because they have strong exposure in the high-end with their department stores as well as the lower end with Nordstrom Rack. They also have a strong online presence. Thus, they are a pretty good barometer of apparel sales. Macy’s and JCPenney also announced disappointing earnings and/or guidance. Here is the chart of the stock price as of November 13th (truly a bad Friday the 13th for Nordstrom as well as other retailers and mall REITs). That is quite a precipitous drop (18% in one day) and speaks to how markets tend to go up like escalators and drop like elevators. I hate it when that happens! Throw in commodity prices hitting lows not seen since 2009 and I’m hard pressed to see inflationary pressures on a widespread basis. There may be some subtle reconsideration of all roads leading to rate hikes by some Fed officials. The first one, Stanley Fischer, is very influential and has been in the centrist camp when it comes to rate hikes. He was just quoted in a Bloomberg article that by having waited to raise rates the harm from a rising dollar was somewhat offset and waiting was the right thing to do. So if there’s a very high probability that raising rates will stimulate even more strengthening of the dollar then it doesn’t take a genius to conclude that higher rates and a stronger dollar could be a very negative combination. After all, he said that not raising rates offset a rising dollar to some degree thereby implying that holding rates where they have been was good for the economy and a rising dollar was bad and that not increasing rates resulted in the dollar appreciating less rapidly than it otherwise would have. I think Stanley Fischer just gave the Fed an out to not raise rates solely because of the dollar. 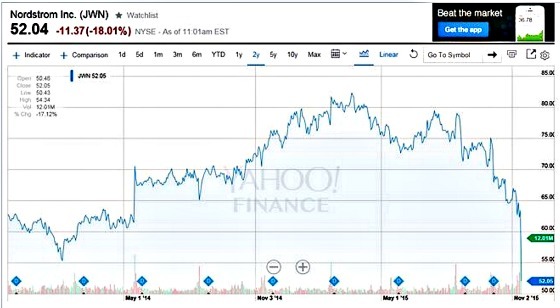 As the following chart shows, it has appreciated quite significantly since July 2014. This has put great pressure on commodity prices and emerging market economies that have a lot of debt denominated in dollars. And here is a good retort to Fischer’s upbeat speech by an economist who said Fischer forgot to address what happens if the dollar continues to get stronger, which is highly probable if rates are increased. 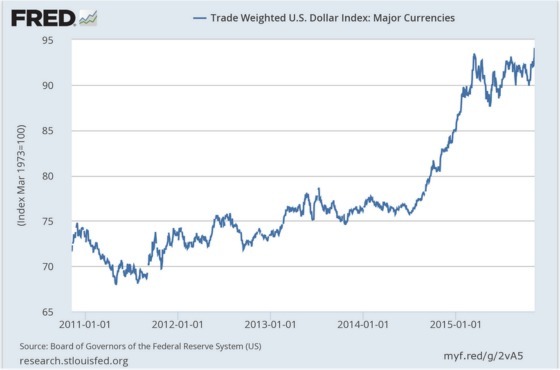 The chart above seems to suggest that the dollar wants to move higher. I have to commend him for being open to the possibility that what he has believed in may actually be wrong and he may need to shift his thinking. Some may argue that I’m too firm in my thinking that rates will continue to stay low for a very long time and I am choosing to see what I want to see because we at CWS have made such a big bet on using variable rate loans to finance our properties. Maybe so, but with cumulative interest savings approaching $40 million over the last four years and much more flexibility when it comes to pre-paying variable rate loans versus fixed rate ones, so far the payoff has been well worth the risk. In the kingdom of the blind, the one-eyed man is king and so far I like what I have been able to see and act accordingly. Will the Fed raise interest rates in December? Do you think that Paul Simon is right? The Fed seems to have talked itself into a rate increase barring some really bad news. So it’s more likely than not that the Fed will increase short term rates. Hopefully by not very much ( 1/8 only ?) and with strong “forward guidance” that the trajectory will be flat for the foreseeable future. Will be interesting to see if the “dot plots” keep coming down. Perhaps a new non-economist governor , albeit non-voting, will talk sense. Michael, thank you for your comment and I would agree with you.